I've said it before and I'll say it again: William Brown may be the best kept secret in hockey writing out there right now. In the 2002 book "Doug: The Doug Harvey Story " he produces a biography that is every bit as spectacular and compelling as his subject. As with his other books, notably The Montreal Maroons and Baseball's fabulous Montreal Royals: The minor league team that made major league history , the key to Brown's brilliance is his meticulous and painstakingly thorough research. Brown has written this text on Harvey nearly a decade and a half after his death. With no first hand account to work with, Brown looks under every stone to find every fine detail about the great Montreal Canadiens defenseman. He interviews everyone from the obvious, such as family and former teammates, to the unlikely, such as a former regular student of the Doug Harvey Hockey School. Brown wants as many opinions and memories on Harvey as he can get, including from many angles and tangents that most of use would never even think of. While his research may be academically impressive, Brown then goes about telling the story of Doug Harvey with a writing style that is easy and flowing, more so than his other books. He has found the artistic ability to recreate history with his writing. You get the sense he is of the highest academic order, but unlike some other such authors, he does not forget his audience. Hiis combination of research and authorship should be mandatory studying not only for sports biographers, but all biographers. 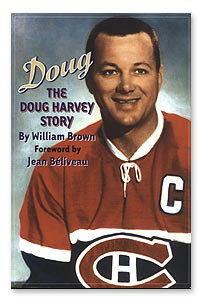 Brown would probably be the first to suggest that the book is amazing because Doug Harvey's story was amazing. Was it ever. Doug Harvey was an athletic natural if there ever was one. He grew up in Montreal's West End a three sport star, arguably better at baseball and especially football than hockey. He turned down professional offers to play both of those sports in order to pursue a career with the Montreal Canadiens. And what a career it was. The perennial All Star and seven time winner of the Norris Trophy as the best defenseman in hockey was an obvious choice for the Hockey Hall of Fame. With his brilliant passing and ability to control any game he was the cornerstone of the legendary Montreal Canadiens that won five Stanley Cups in a row. in the 1950s Most people still consider him the second best defenseman of all time, and one of the top 10 players in all of hockey history. Many of the oldtimers will tell you he was better than Bobby Orr. Off the ice he was perhaps more fascinating, although often tragically. He was very much his own man, never one to tow the line and do what was expected. No, he was very much a rebel. He was an outspoken critic of the hockey establishment and, along with Ted Lindsay, the driving forced behind the attempted formation of a players union in the late 1950s. He was labeled a maverick and a troublemaker, aloof and enigmatic, but deep down he was a caring, generous, and in his own way a very funny man. But he was very much his own man. Harvey continued to march to the beat of his own drum after hockey too. On the night he was supposed to attend his Hockey Hall of Fame induction ceremony, he chose to go fishing. Later on in life he lived in an old rail car. It was not the cold and abandoned rail car that some sources will have you believe, though. It was actually quite stately - it belonged to Canadian Prime Minister John Diefenbaker and was formerly used to transport royal guests. Harvey lived a nomadic life, almost as if he was lost after hockey. His heavy drinking days dated back to his time in the NHL, but it got out of hand in retirement. He became fatally ill with cirrhosis of the liver. Also, much too late in life, he doctors suspected he was, which could explain his severe depression and mood swings. I think what I like best about this book is that unlike some other Harvey biographers, Brown does not portray Harvey's descent as sad and tragic. That's because Brown got to know Harvey better than anyone else, and as such he inherently knew that even in his toughest times Doug Harvey never viewed himself that way. It's all here in William Brown's excellent book Doug: The Doug Harvey Story. From his one ice brilliance to his off ice troubles, one thing is obvious: Doug Harvey was one of hockey's most interesting personalities.